After awhile, holiday cookies will lose their appeal. 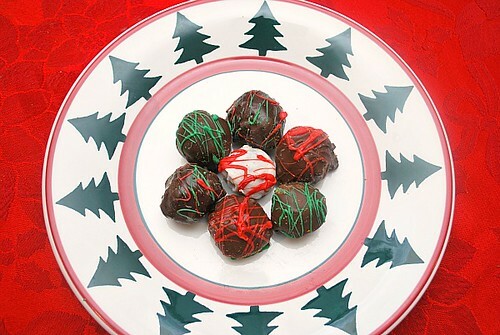 Before you think about tossing them out, crush them, combine with cream cheeese, roll them in bite sized balls and dip them in chocolate. It's so easy, you have to try it! Inspired by the popular Oreo cookie truffles, the concept pretty much works with other cookies. I made the above platter of truffles with peanut butter cookies, chocolate chip cookies, sugar cookies and snickerdoodle cookies. What kind of cookie truffles will you be making? Shape into 48 (1-inch) balls. Dip in melted chocolate; place on waxed paper-covered baking sheet. Chill 1 hour or until firm. Store in tightly covered container in refrigerator. 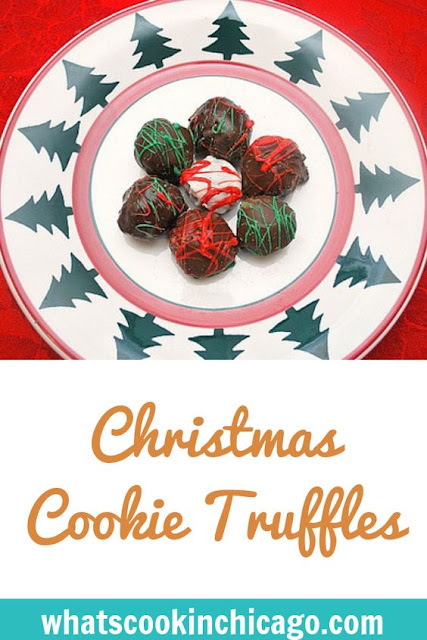 I love the idea of using different cookies in these truffles! I always have so many left over... Actually I have over a dozen gingerbread men in my kitchen right now. Gingerbread and chocolate.... I think it could work! great idea,I was planning on making some cake pops and using cookies sound even better! Thanks for this. Very nice idea :) love it!